Time to get out of the house and pump up your iron levels. It’s February. February is Burger Battle o’clock. Time to get out of the house and pump up your iron levels. This is the final round, so we didn’t hold back: 21 burgers is the most we’ve ever let in. It was an Excel Sheet glitch, to be perfectly honest. But all the more of a challenge to past Burger Battle warriors like Katherine Neil and @Lansdellicious to get out and try every one of them, one last time. Will Seto do the impossible, and win Critic’s Pick for a 3rd year in a row? Will the original Burger Battle champion, Chinched Bistro, reclaim their burger battle glory? Who knows, but don’t forget to cast your votes for your favourite burger in the poll below, and if you want a checklist to keep track of your Great Burger Adventures this month, click here. 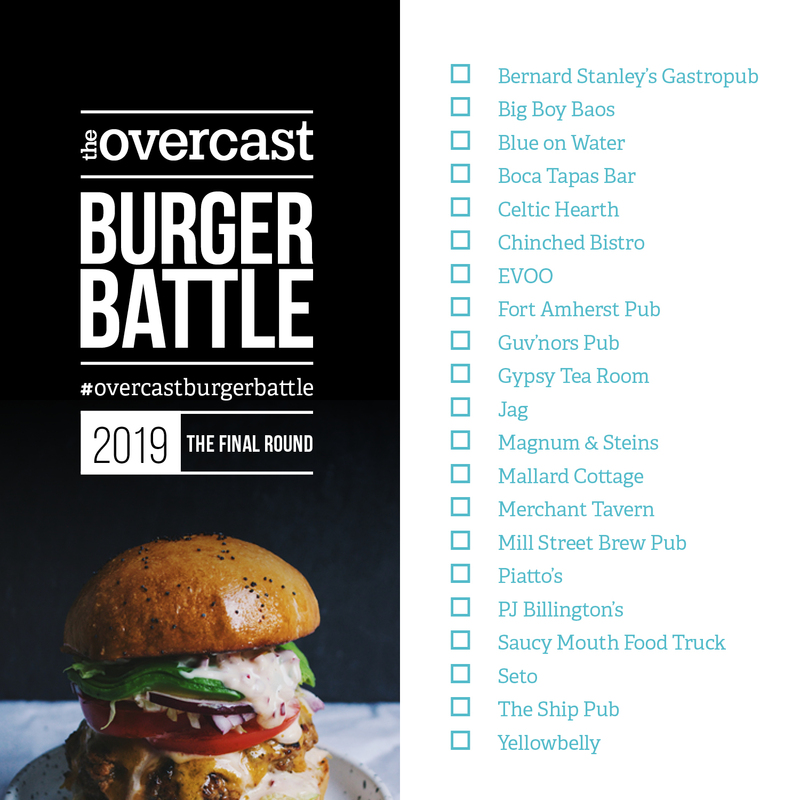 Note that half of these restaurants will have a $5 Quidi Vidi Beer special, to help wash down the burger (while others will have special in-house recommendations). 8oz beef and pork burger patty stuffed with mozzarella cheese, with QV cappuccino stout and dark chocolate BBQ braised pork belly, roasted garlic aioli, roasted corn and red pepper salsa, crispy jalapeños, and an over easy egg. Served on a Pretzel Bun, with a side of truffle fries. A General Tso chicken Bao-ger, with shredded cabbage and carrot sesame slaw. Choice of a side. *Only available on skip the dishes and Seto’s late night menu. An 8 ounce 40/40/20 blended patty of pork, beef, and shiitake mushrooms. The patty is seasoned with lemongrass, cilantro, garlic, and chilies. Served on a sesame seed bun with Mu Wan (caramelized pork belly), coconut curry mayonnaise, sweet thai ketchup, sui choy coleslaw, and a peanut crumble. Served with a choice of fries/salad/soup. A beef and chorizo patty, topped with melted manchego cheese, roasted red pepper, Spanish pickles, and a creamy romesco sauce. It’s served on a toasted Brioche bun, garnished with sweet drop pepper, olive, and chorizo chips. Served with a side of truffle patata bravas and grated Parmesan. Our signature 6oz Moose burger, topped with mac and cheese, beer braised ham, crispy onions, and spicy ketchup. It’s served with my Mom’s potato salad, coleslaw, and fresh fries. Spicy Italian Sausage Patties, Mortadella, Salami, Tomato Relish, Pickled Onions, 5 Bros Chili Jack, Garlic Caper Mayo. The “Double Beyond” comes with jalapeno sunflower cheddar sauce, fried pickles, garlic aioli, and a side of pickled red onion rings. 2 fresh ground AAA Striploin patties, braised short rib, aged white cheddar, balsamic roasted beet slaw, grainy Dijon + burnt rosemary marrownaise, and iceberg lettuce, with cured Foie Gras. Served with shoe string fries and house seasoning. A seasoned beef patty with Canadian back bacon and deep fried cheese curds, smothered in our house BBQ Beer Sauces (made with Split Rock Brewing Co. Red Rye Ale). Served on a Rosemary Bun, with kettle chips. Ground chuck, duck bacon, berry ketchup, five brothers cheese curds, crispy pickle red onion, and local greens on a house-made brioche bun, served with chips & dip. A Lamb donair burger, made with Haricot Farm lamb, and a housemade donair sauce. It’s topped with marinated cucumber, feta, and tomato, and served on a brioche bun. Side of Pita chips. A deep fried jerk chicken burger, with jalepeno mac ‘n Cheese, and garlic & chive aioli. A moose burger on an alder berry brioche bun, with house-smoked bacon, gruyere cheese, caramelized shallot aioli, and arugula. A housemade chorizo burger on a fresh bun, with manchego cheese. It’s topped with greens, avocado crema, and pickled red onion. Served with Spanish fries. (Recommended Beer Pairing: Millstreet Rye Rye Tee). Beyond meat veggie patty, arugula, kimchi ‘slaw (housemade kimchi with NL cabbage, cucumbers, and carrots), over easy fried egg, spicy mayo, gochujang sauce, and nori crumble on a Rocket Bakery Black Brioche sesame bun (made with activated charcoal). Served with a side of house cut double fried fries. Chinese BBQ duck burger, with spicy peanut butter, pickled cabbage & onion, and crispy bits, on a sesame milk bun. Served with duck fat taters. A smoked mushroom and beef patty, with tomato jam, house pickles, celery salted kettle chips, lettuce, roasted tomato & black pepper aioli, and a deep fried bean. Served on a handmade bun. Crispy chicken skin and grilled pork burger, served on a homemade crusty pretzel bun, with pineapple-onion dip, beetroot, cucumber slaw, and fried herbed cream cheese. Side of root vegetable fries. and cast a ballot for your ONE favourite burger, of all the ones you tried. Wow!!! Awesome service, beautiful food!! Wow, so much inconsistency, you normies haven’t got a clue! Love Magnum & Steins Burger! Jerk Chicken, Jalapeño Mac & Cheese equals awesome! Seto headed my sample of the pack, for the best taste all-round. Very honourable mentions to Piatto for their excellent pizzaburger and to Exile, On The Lamb. Enjoyed the BSG mess too, though staying awake afterwards was a challenge, a bit embarrassing when it’s lunchtime. Hope the Battle finds a way of continuing next February. This year the competition is really, really tight. I had to try some multiple times to make up my mind. Seto, Boca, Fort Amherst, Bernard Stanley and Big Boy Baos are likely my front runners. The burger at Chinched has the perfect amount of kick…not too spicy and sooo yummy! The BOCA burger was amazing!!! The Guv’nors Pub burger is absolutely unreal- so good that we had to come twice! Hoping it’ll be something they think about keeping on their menu! Governor’s Pub Big Red not bad for the Governor’s Pub where I usually get the wings. Magnum and Steins Jerk Chicken was fun with the mac n cheese and duck nachos for a side. The Ship’s Hail Caesar was yummy and dessert of folk night was great. The Jag’s Lamb Donair was barely food and each of us (4) at the table had different stuff missing from it and I have never been treated so badly while paying for food. Excited for Yellowbelly’s tonight! Have tried both Piatto and the Merchant Tavern so far – they are both AMAZING and it was hard to choose just one favourite but ultimately that pizza dough bun at Piatto won my vote. Blue on Water was the best burger so far. Delicious you gotta try it. Honest da jayzuz, we tried a few burgers and our favourite is Pj Billingtons! Please do the world a favour and try it. We really thought it would be the worst. Totally an underdog! Blue on Water’s Thai Fighter is a phenomenal burger that you don’t want to miss! Chef Grevatt and his team did an excellent job! Highly recommend it! Blue on Water Thai Fighter burger is the best I have tried so far. It is delcious! The burger at the ship is AWFUL! Fort Amherst was so good, I had to go back a second time for another. The yellowbelly burger was a bit of a disappointment, I expected more. The gypsy burger was great albeit a little dry. Fav so far is the pizza burger from Piatto! Burger In Boca Tapas Bar is so good . Don’t miss out on the Gypsy Tea room. The chuck with duck bacon and 5 guys cheese is unbelievable. Not to mention the fries and absolutely flawless house made berry ketchup. Not to be missed! Bernard Stanley’s drunken saucy mess is delicious! Highly recommend. The Thai Fighter from Blue is so surprising, fresh tasting and absolutely wonderful. The Stellan from Gypsy was the one I was most excited for, but found the patty so dry and disappointing. Their fries however, were fabulous, best fries I’ve ever had. Blue on Water’s burger is sooooo damn good 😍 The flavours complement each other so well, and the coconut curry is to die for! Also, deep-fried pork belly on a burger? Genius! 12/10 would recommend! Blue on Water Thai Fighter Battle Burger has awesome flavours! The bottom bun was a little soggy due to coconut curry sauce but otherwise a top notch burger! Recommended!